There are few surviving examples of early Italian embroidery, one that does survive consists of polychrome silk on a gold fabric ground. The true beginnings of embroidery in the medieval period in Italy begins with the works of the great workrooms of Palermo in Sicily. After the Norman conquest of the island Roger II patronised the embroiders and improved the skills of the local silk weavers by importing professionals from Byzantium. This helped to produce one of the most magnificant pieces of the Medieval period, the Coronation Mantle of Roger II which was later used by the Holy Roman Emperors. Middle Eastern and Byzantine influence can also been seen in the pattern and motifs used in the embroideries, such as the work in gold thread on yellow silk from Assisi featuring a continuous pattern of griffins and parrots. By the end of the 14th Century, the political troubles of the island of Sicily were affecting the production of textiles on the island. The Guicciardini Quilt, is of more humble material (linen and wool) and design, reflecting this instability. The work of the 14th and 15th Centuries reflect the growing power of individual families and cities in the patronage of art in all its forms, including embroidery. Large works commissioned for the Church, worked in gold and silks were produced by artists of great reknown. 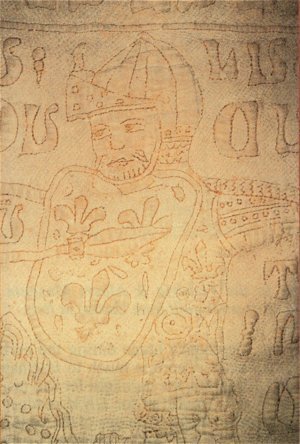 By the second half of the 15th Century, the technique of or nue was gaining popularity over the previous use of split stitch and needlepainting. As in other parts of Europe in the 16th Century, use and production of needlework in the domestic setting was on the rise. This was encouraged by the development of the printed pattern book, which were intended as embroidery pattern books but were used in other ways as well. Many of the designs are shown on a grided background, making them suitable for various types of counted work embroidery, such as voided work or net darning. Items that were decorated included cushions, table linens, bed hangings and other related items, clothing (especially chemise / shirts) and other domestic items.